$400 worth of dirt and rocks. Boy do I hope that tomorrow we get enough digging done in the back yard to get our driveway back. 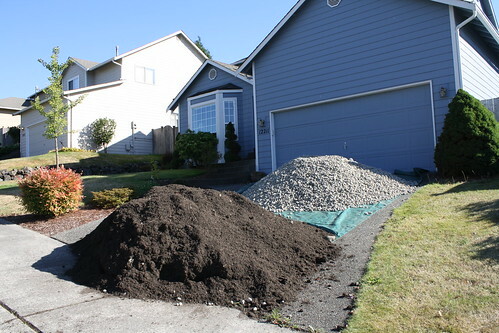 For reference, that’s 4 yards of Pacific Garden Mulch and 3 yards of 1 1/4-inch drain rock from Pacific Topsoils. I’ll add that I had an excellent customer experience with the Pacific Topsoils people, and I’ll certainly go back to them for our future dirt/rock needs. 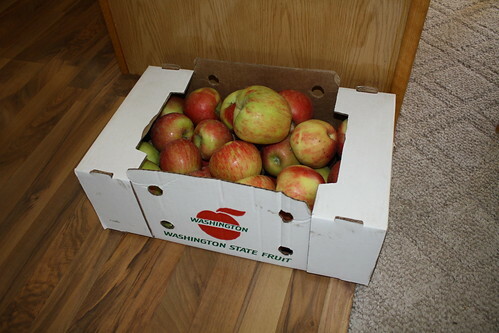 20 lbs of honeycrisp apples. We are going to use our dehydrator to convert this large box of apples into a very tiny volume of apple chips, which we’ll consume in a matter of days. I have a decent idea that I’m excited to pursue as a legitimate, non-sarcastic, non-parody novel. Of course, I’m counting on having time to write this November. If I actually get some OSPI teaching work (har har), that might make NaNoWriMo difficult. But I can always do it in December, or any other arbitrary period of 30 days. 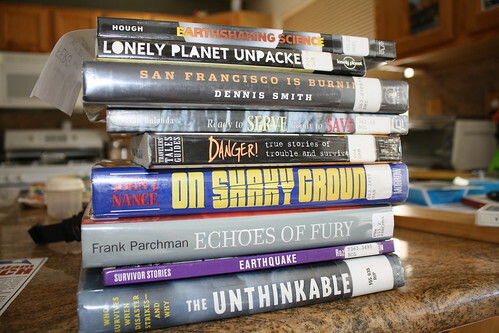 This stack of books comes to me courtesy of research librarian Michael, at the Bellevue Regional Library, who put them all on hold for me after reading a description and question I emailed to KCLS. I love it when my tax dollars are at work for me. The bike ride Dad and I did today. We’ll be digging ditches and ponds in my back yard tomorrow, and Sunday is church, which equals a weekend with NO BIKE RIDING*. Happily, Dad has loads of vacation time and could take Friday off for bike riding. And the weather cooperated, giving us a very warm, sunny, windy day. And today is what I think of as Flipover Day, more officially known as autumnal equinox, so it’s amazing to be worrying about overheating. *This is probably the first such weekend in 8 or 9 months. I’ll hardly know what to do.